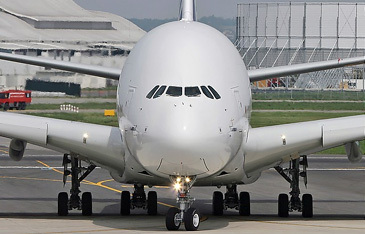 The world's largest passenger plane, the Airbus A380, has taken off on its long-awaited maiden flight. Thousands of aeroplane enthusiasts, many of them clapping and cheering, witnessed the twin-deck "super-jumbo" taking to the air for the first time. 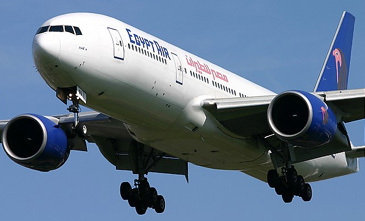 The flight should last between one and five hours, depending on weather conditions and how the plane handles. The plane is carrying a crew of six and is filled with about 20 tonnes of monitoring equipment. Airbus, which is owned by European firm EADS and the UK's BAE Systems, sees the A380 as the future of air travel. Arch-rival Boeing has instead chosen to focus on mid-sized short-haul aircraft. The A380 - designed to carry as many as 840 people between major airports - took off from its production site in Toulouse, southern France. The crew are expected to take the plane out over the Bay of Biscay, before returning to base. The crew will not be taking any chances, and will wear parachutes during the flight. There also is a handrail that leads from the cockpit to an escape door. During the flight, there will be a live satellite feed of data which will be monitored by a team of experts on the ground, Airbus said. Earlier Airbus test pilot Jacques Rosay told the BBC that: "We are confident with what has been done up to today. "But we still have some doubts. We have to be very careful during all the flight because, as you say, when you are looking at new things, something may happen. "But we are still very confident." More than 50,000 people are thought to have watched the take off, many of them sitting on the grass banks that line the runway. The take-off is also being broadcast live on television and thousands of enthusiasts saw the take off via a giant screen in Toulouse's main square. Most of the tests will be carried out at 10,000 feet and within 100 miles of Toulouse, said Peter Chandler, deputy project pilot for the A380. He added that the plane is flying with its wheels down as a safety measure, and that the A380's hydraulics and electrics had all been tested while it was on the ground. More than a year of flight-testing and certification-programme work will now follow before the A380 starts commercial services. Pilots will then have to push the plane far harder then they have on Wednesday, testing for extremes of speed, altitude and temperature, experts said. The project, hailed as a European success story by leaders including France's President Jacques Chirac, has had its share of problems. In December 2004, Airbus' main shareholder EADS, which has an 80% stake, revealed that the project was £1bn (1.5bn euros; $1.9bn) over budget, at more than £8.4bn. The UK's BAE systems owns the remaining 20% of Airbus. Airbus is bullish about the A380's commercial prospects. 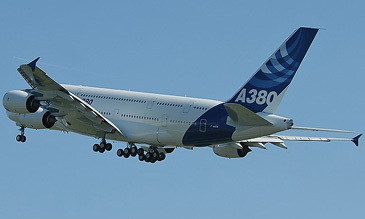 Superlatives often surround any mention of the Airbus A380 passenger jet. France's President Jacques Chirac has described the giant plane as the "crowning achievement of a human and industrial adventure," while Britain's Prime Minister Tony Blair has dubbed it "the most exciting new aircraft in the world." When the double-decker A380 takes off for its maiden flight - weather permitting - across the skies of France on Wednesday, it will certainly be the world's largest passenger airliner. But does Europe's flagship commercial jet, which is due to come into service next year, have what it takes to be a financial success? 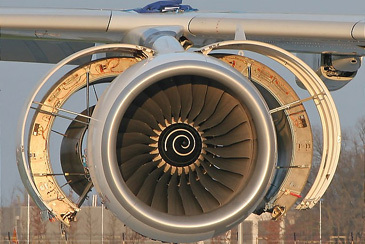 The Toulouse-based aircraft maker, which is jointly owned by pan-European aerospace giant EADS and Britain's BAE Systems, is bullish about the A380's commercial prospects. Airbus says the jet will carry more passengers, in greater comfort, and over greater distances, than any other passenger plane - in particular Boeing's 747 jumbo jet. It also points to fuel efficiencies offered by the A380, and says it is comfortably on track to meet a break-even sales target of 250 aircraft, with 154 orders secured so far. Arch US rival Boeing, which recently lost its position as the world's top passenger jet maker to Airbus, has countered with its own vision of the future. It is busy developing its smaller, long-range 787 'Dreamliner' aircraft, which will carry about 250 passengers (far fewer than the A380's 555 to 840 seats), but promises fuel savings of 20% compared with similar mid-sized planes. Boeing argues more passengers will want to fly between smaller regional airports, rather than the select giant hubs required to service A380s. "The A380 could be a disaster," says Boeing's former boss Harry Stonecipher, pointing to the commercial flop that was the Franco-British built Concorde. But while the A380 is unlikely to suffer the fate of its supersonic predecessor - only 14 Concordes ever went into service - Airbus still faces a number of challenges. The A380 project is running vastly over budget. In December, Airbus admitted the plane's development would cost an extra 1.45bn euros (£1bn; $1.9bn), bringing the overall cost to about 12bn euros. Airbus has received billions of euros in 'launch aid' - loans to cover a third of the development costs - for the A380 from European governments, and the company insists it will still make a 20% return on its investment. "That sounds like an ambitious target, when you consider the industry average is 10% to 12%," says Tim Coombs, managing director of airline industry consultants Aviation Economics. Airbus predicts it could sell in excess of 700 A380s during the estimated 30 to 40-year lifespan of the aircraft. 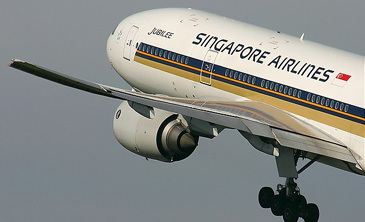 Singapore Airlines' Boeing 777-212/ER at Manchester International in England on April 17, 2005. Boeing has yet to say if it will challenge Airbus with a larger B 747. Some 15 airlines have so far ordered A380s, but Mr Coombs says the attitude of other carriers remains more sanguine, as they struggle to deal with rising fuel costs and cutthroat competition. "There are some airlines that are taking a wait-and-see attitude," he says. Boeing has yet to announce whether it plans to take on Airbus directly for a slice of the so-called 'superjumbo' market, with a revamped version of its own 747 jumbo jet. However, the booming market in second-hand aircraft - which are available at a fraction of the cost of the A380's $285m list price - could still divert the interest of some potential customers. "Airbus will be reined in to a degree on the price it can charge for an A380 because there are new and second-hand alternatives that airlines will look at," says Mr Coombs. Older passenger jets - while cheap - are often noisier and less fuel efficient than later models, though. And while analysts wait to see if the superjumbo market will fully take off, few doubt that Airbus will be able to hail the A380 as an aviation industry success story. For Europe's political and business elite, too much is at stake for any other conclusion to be acceptable. But whether the A380 will be a money spinner, only time - and more orders - will tell.